This article is a review of NIGHTCRAWLER. 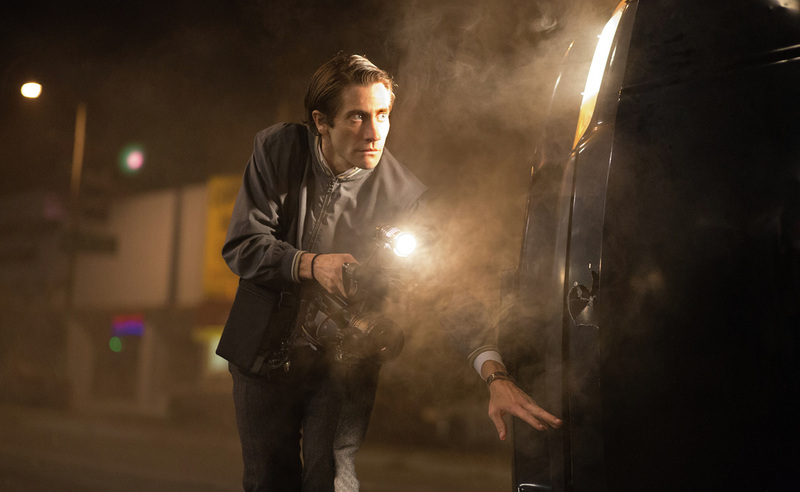 As a creepily compelling bottom feeding newshound sociopath, Jake Gyllenhaal excels. Gaunt, eyes bulging, conscience-less Lou Bloom is the stuff of nightmares, if he wasn’t so crazily charismatic. Our initial intro is the protagonist stealing fencing from an industrial yard. Caught in the act by a security guard, the whippet sharp Bloom is no weakling and overwhelms his opponent. What state the guard is left in is up to our imaginations; the only clue: Lou wears the security man’s expensive-looking watch. Hawking the fencing at a metal works, Bloom asks the owner for a job. Shot down brusquely with an observation, “I’m not hiring a f**king thief,” Lou immediately reassesses career prospects. Mind constantly ticking away for advancement, in every situation, not through honourable methods but through ends-justify-means ruthlessness, is how Gyllenhaal skilfully plays the lead. On the freeway at night, a car crash, and Bloom comes across Bill Paxton’s Joe Loder, who eventually opines, “Take it from me, I’ve been nightcrawling for 14 years.” Listening into police radio communication, these below-paparazzi slime of humanity aim to be first on the scene of car crashes and shootings to get the scoop on as grizzly aftermaths as possible, to satiate local news stations. ANCHORMAN 2 unsubtly (and humorously) commented on public appetite for the exploitative. News editor for the vampire shift of Channel KWLA 6 in Los Angeles, Nina (Rene Russo), goes further and lays out succinctly what the station is after: Victims have to be Caucasian with preferably the poor and/or minority as perpetrator. An analogy is given straight out of horror movies: Think of a woman running down the street with her throat cut. Loder turns down Lou for a job, but rejection has no impact on Bloom’s self-confidence. His calling has been found. Cinematographer Robert Elswit (THERE WILL BE BLOOD, BOOGIE NIGHTS) infuses the City of Angels with a Michael Mann cold slickness, and Dan Gilroy, making his directorial debut, admixes a winning Neil LaBute-like witty misanthropy. Out of the gates, Gilroy has a self-assured arch darkness that many seasoned cinema vets would surely dream of. Set pieces involving murder have a muscular distance, which induce shock and disgust as well as a demand to be witnessed. Transitioning from newbie nightcrawler to adroit professor is a thing of cynical joy. And one is cleverly manipulated into somehow warming to the lead. Self-help inflected loquacious monologues, digested and spat out through his corrupted world view, have the audience hanging on every word. Wait till you get a load of Lou Bloom implementing those thoughts.